Dyett & Bhatia (D&B) was part of a national team led by Duncan Associates that worked with the Mayor’s Zoning Reform Commission on a comprehensive revision of Chicago’s zoning regulations. D&B was responsible for revisions to zoning for the City’s central area to implement the new Central Area Plan. Issues addressed include bonus provisions for pedestrian streets, plazas and other amenities as well as linkages with the City’s transit improvements programs and housing policies. 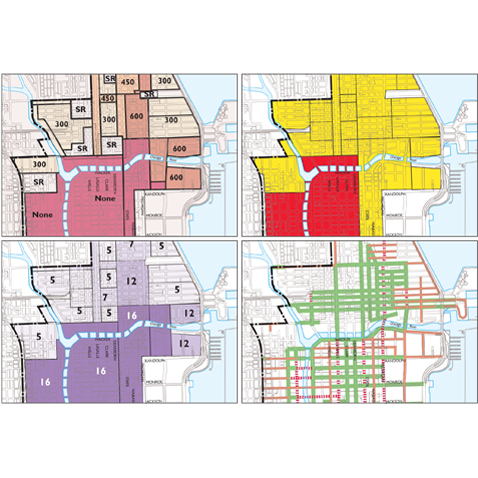 The ordinance that the City adopted in 2004 created a series of new Downtown districts for the Downtown core, residential and service areas, and Mixed Use Corridors to simplify administration and allow standards to be tailored to the needs of the City’s central area.